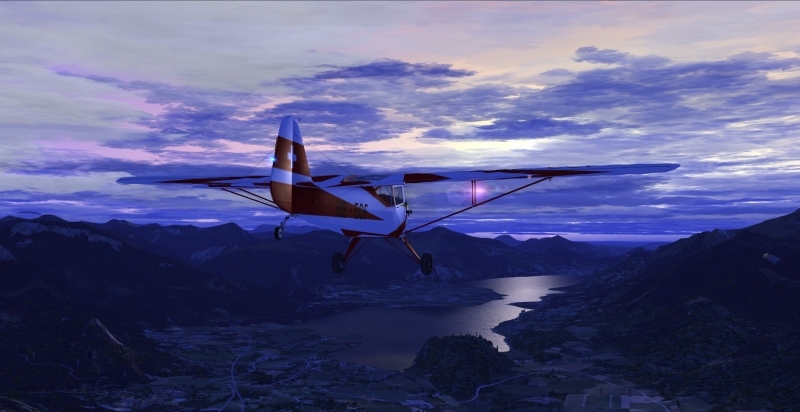 Here are a few ideas on how to get great screenshots while flying. Irfanview is an image manipulation application you can use if you don't have anything else. It allows you to crop, optimise and resize your pictures. (Remember there is a 256Kb size limit for competition entrfies). 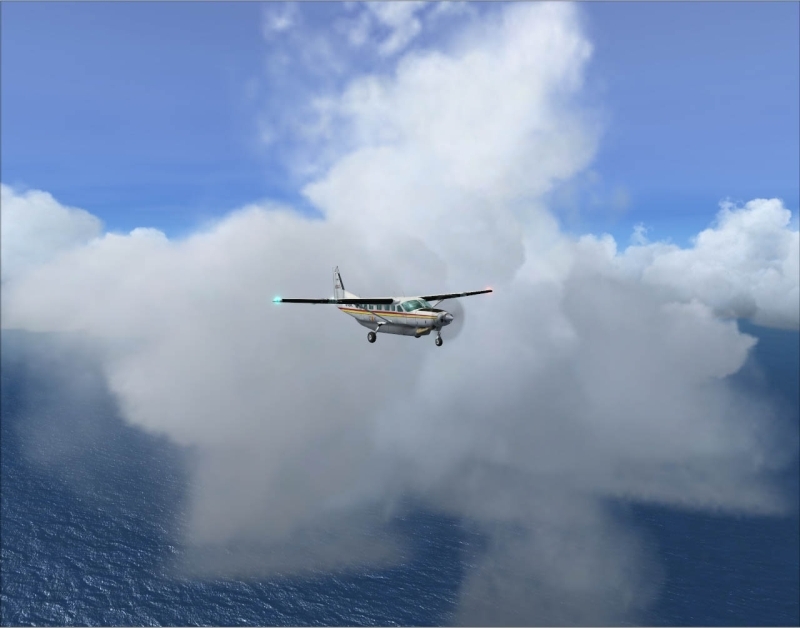 Don't forget that you can also press the "V" key to capture a screenshot while flying or playing back a recorded flight. Of course, as the Australians say of their National Lottery, "You've got to be in it to win it", so take those screenshots and enter the competition! The SSC program provides an easy method of entry and voting for each monthly Screen Shot Competition. Good pictures, be they paintings, photographs or screenshots have to capture the imagination of the viewer. There are a number of ways of doing this. Here are some, but by no means all. Use of colour to create a mood, be it dramatic, peaceful, beautiful, bright and happy, sombre and sad. Sunsets are the classic mood picture. A strong or unusual viewing angle adds impact - often seen in close-up shots where your imagination fills in the peripheral detail. To tell a story, a snapshot which tells the viewer what went before and what probably will happen afterwards. Composition detail - where objects are placed to create an unusual or possibly amusing effect. 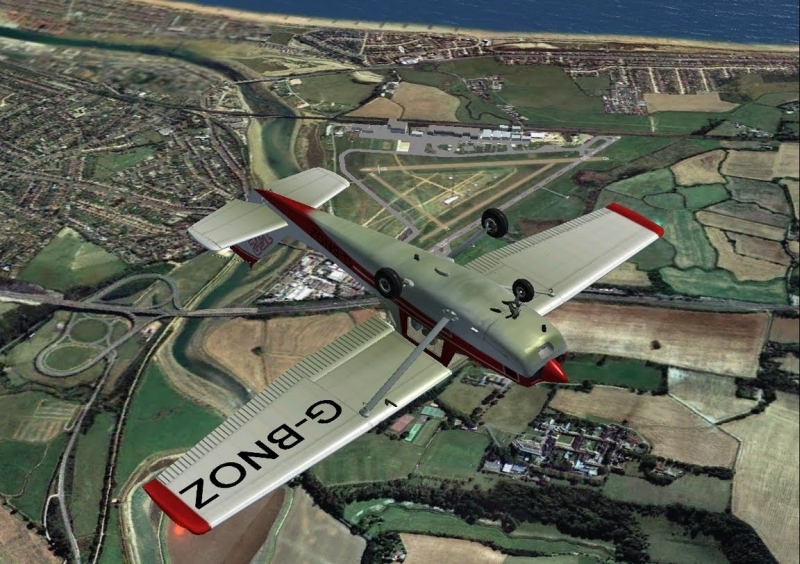 The picture opposite shows Shoreham airport very carefully framed in the angle of the aircraft body and right wing. The inverted aircraft adds impact and the caption "Field in sight" is intentionally humorous. You would never capture such a shot while flying. 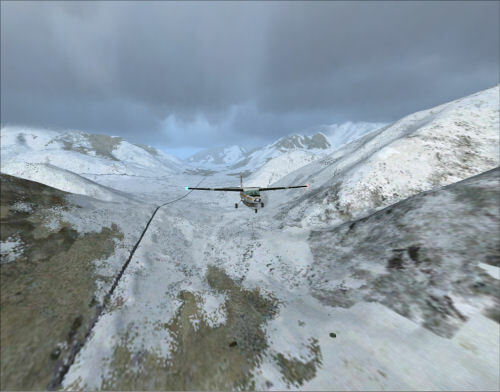 The best way to get good pictures is to record the flight using FSRecorder, and take the screenshot during playback, perhaps with the flight paused. There is no Club rule which says that you cannot do this. The only rule is that competition entries must have been taken during a valid Club Flight as defined in the Club rules. The virtual monochrome effect of this shot gives it superb impact. Then additional features add to the enjoyment - the cloudscape, and the sun's reflection off the loch water surface. Finally the wide format cuts out superfluous dark foreground and sky which would be present in a more traditional 4 x 3 format. The picture contains nothing which is unnecessary. Here the silhouetted aircraft against an unusual cloudscape provides the impact. The orange to indigo evening sky is something FS seems to be good at creating. Perhaps for this reason, sunset shots are often entered in the competition. This shot shows another aspect of composition - the position of the horizon. The cloudscape and the sky colours are the important feature, so the horizon is very low down. Normally you do need a horizon to provide perspective, but not always. Here's another sunset shot. But look again. 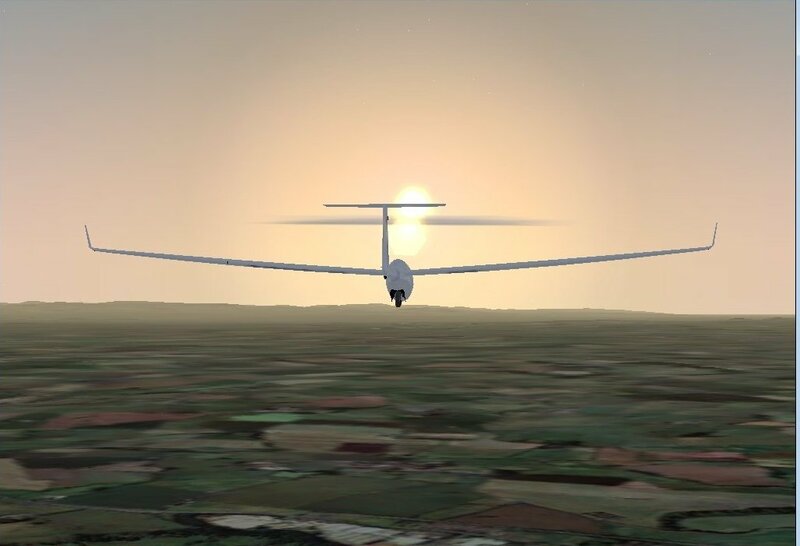 The unusual camera angle deliberately picked up an "echo" of the glider's elegant shape in the single small lenticular cloud just below the T-tail. The silhouette directly into sun with the halo around it adds a hint of mysteriousness. 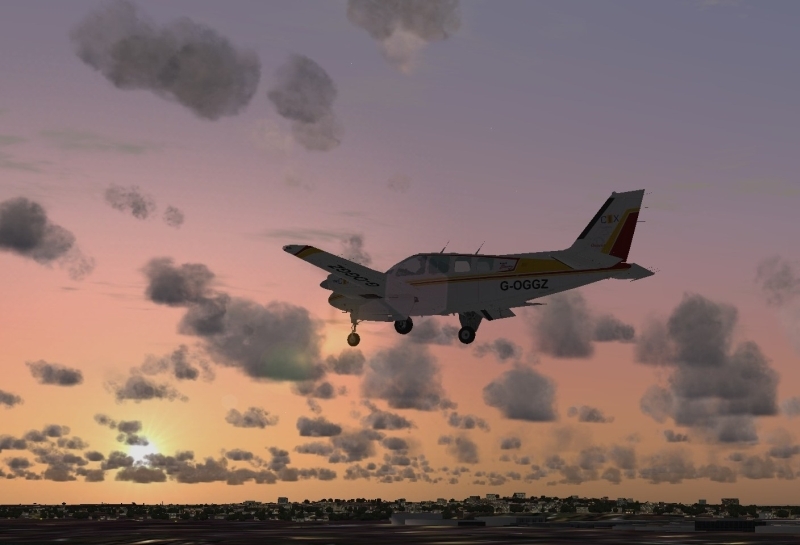 The colours, the halo and the fortuitous cloud were not contrived - that is what FSX provided. It suggested the view angle which the "photographer" used. 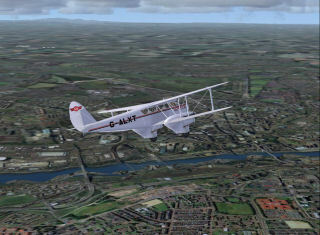 Unlike the others on this page, this shot was not taken on a Club Flight, so was not entered in the competition. Here is another 2009 competition winner. Sunset shots are always pleasing, but too many in a competition and they become boring. Try a sunrise shot for a change, like this one. The colours are quite different - colder, expectant - a beginning, not an end. Even in low light, a large foreground area needs texture to avoid it looking "slabby". The lights of human habitation do that perfectly here, adding texture and providing the base for the dawn mist creeping towards them. The rising sun enhances the silhouette of the aircraft, but there is just a little detail visible in the aircraft, which is more pleasing than a totally black object. This is an example of using an unusual camera angle to create impact. With FS paused, you can move the hat switch in external view, zoom in and out to get just the composition you want. And don't be afraid to get in close. 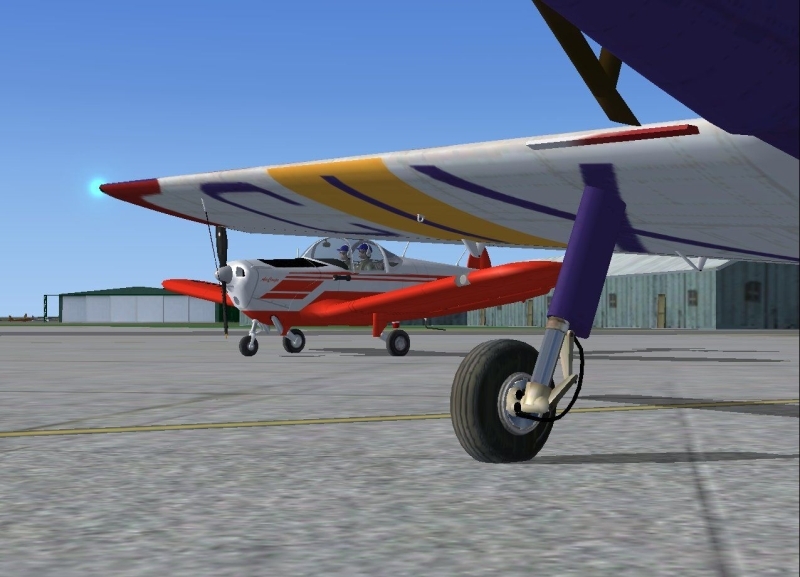 Using the hat switch and zoom enabled the Aircoupe to be nicely framed under the Chipmunk's wing. The bright colours of both aircraft against the large area of plain grey apron and equally large area of cloudless sky focus the eye on the essentials. The Chipmunk wheel is a dominant object, but is not the main subject. So be careful not to position such objects where they intrude. Certainly never in the centre of the frame. Never? Well - hardly ever. The "In yer face" camera angle gives this picture an aggressive quality, but the symmetry of the aircraft seen from this angle is pleasing, and tames the aggression. This type of shot probably works best with twin engined aircraft but, like sunsets, is one you have to be careful not to use too often, if you want to capture and hold a viewers imagination. Occasionally the subject of the picture does warrant being slap bang in the middle. 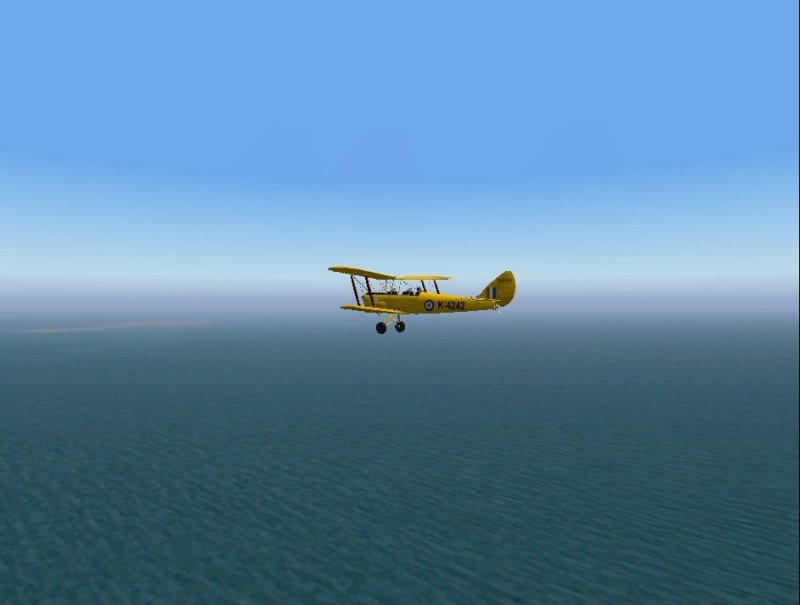 This composition is of a deliberately small aeroplane in a vast expanse of sea and sky. It isn't a picture of an aeroplane, but is telling the story that the pilot is (and feels) quite alone. The aloneness would have not been so dramatically stated had the aeroplane not been in the centre. Rules can be broken in art (screenshots are an artform in their own right) and the rule about not putting your subject in the centre is again being broken here. 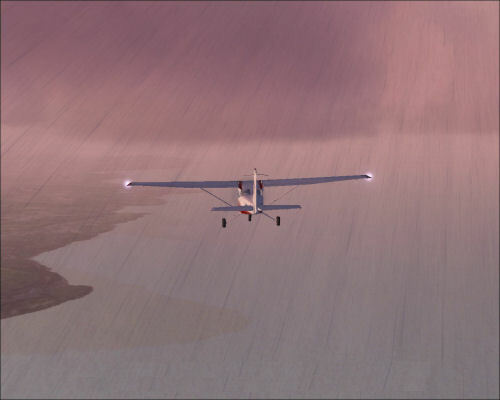 This is another story-telling picture - the aircraft is hurrying away from bad weather. If the aircraft had been placed to the left, the story would be "Any minute now and he's in those thunderclouds - very bad news". If the aircraft had been across to the right, the story would have been "Phew! He's getting away". 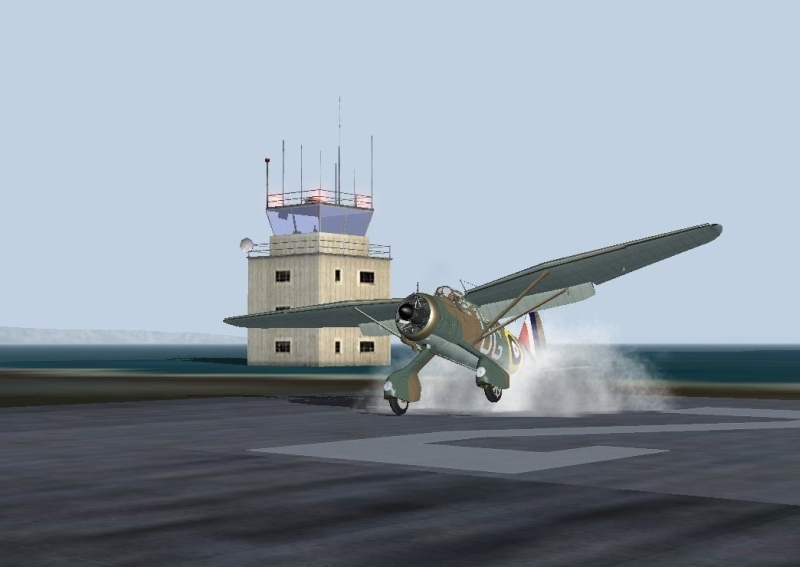 By putting the aircraft in the middle, the tension is held "Will he - won't he escape?" The small aircraft again emphasises the power of the clouds and the fragile nature of human aviation. 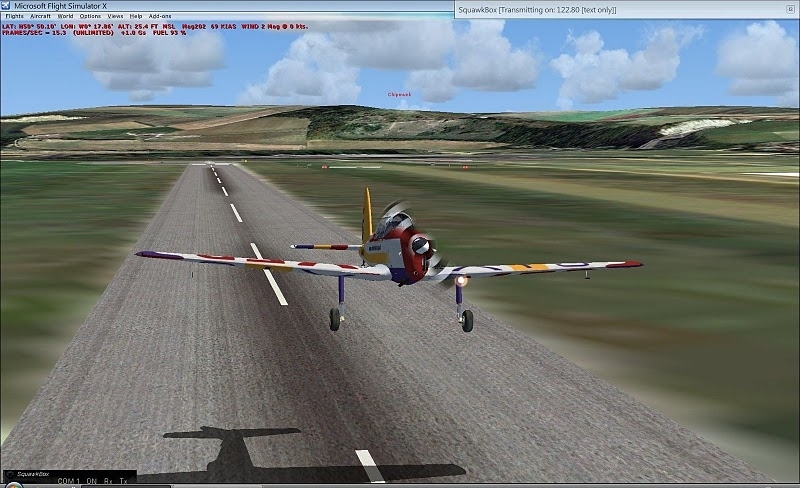 Action shots in a screenshot within FSX are not easy to obtain, because FSX doesn't give many "action effects". You can lay a smoke trail - particularly good for shots of aircraft performing aerobatics, and if you are quick, you can capture the smoke from the tyres at the moment of touchdown, or the cloud of black smoke when an engine is started. Such shots are impossible without using FSRecorder, unless you are skilled at landing from outside view. This shot also tells a story. The pilot was having a spot of bother with a strong crosswind! Here is a nice action shot which also tells a story. In shots like this, beware of ambiguity of the storyline. 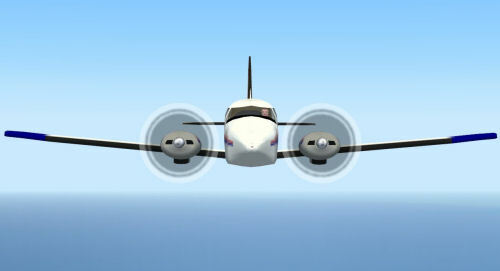 This aircraft is clearly taking off as seen by the pitch angle and the length of runway behind. If it were taken a few moments earlier, the viewer wouldn't be sure whether it was a landing or a take off. 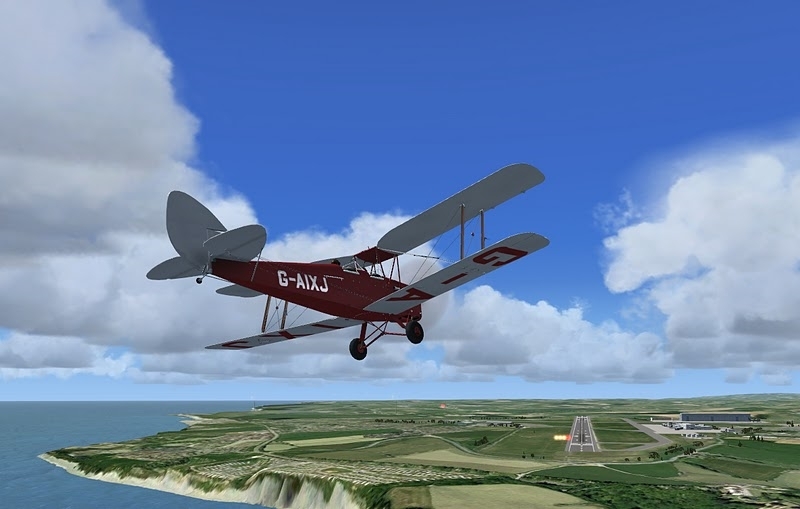 Including the aircraft shadow is a nice touch, emphasising lack of contact with the ground but do switch off the red text at the top of the screen when planning to take screenshots. The Competition rules allow for cropping out the Windows borders, and the text, but sometimes cropping would spoil the picture. Note the Squawkbox TX/RX box which the "photographer" has moved almost off screen but not quite. To crop that out would lose most of the aircraft shadow. "Landscape with added aircraft" can be winners. The landscape becomes the main feature, so it needs to be spectacular. Mountains, lakes, especially with interesting reflections or weather such as snow all can make great subject material. This one wasn't entered in the competition, but perhaps it should have been! Here's a "moody blues" landscape not unlike the third picture on this page, but here the reflection of the dying sun off the water is what makes it special. It could have been improved further by moving the horizon higher and showing more of that "so real you get wet" water texture. As a general rule, the horizon is best not placed halfway up the picture anyway, although that is another rule made to be broken when necessary. Sometimes a picture has so much in it you can look at it many times and still see something new. 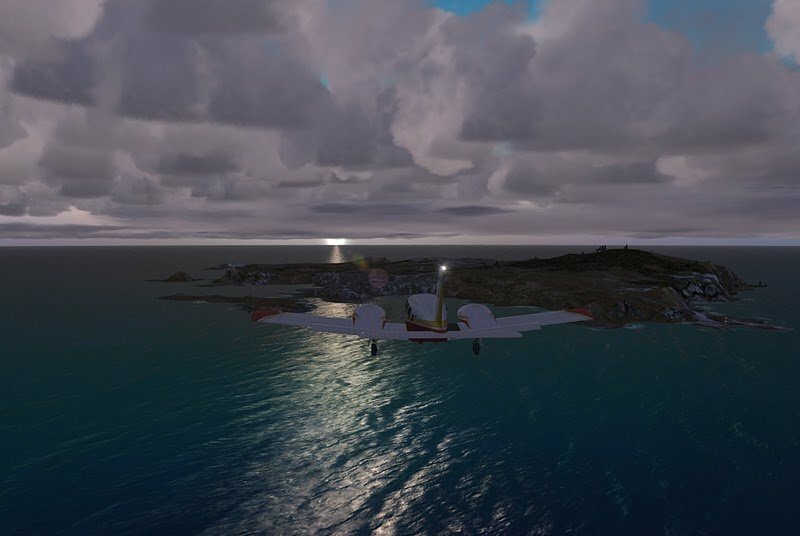 The camera angle here has created impact which creates an immediate attraction, and then you notice the detail in the landscape - the runway, the cliffs, the PAPI lights, and what looks like another set of PAPI lights in the distance. Two airports so close together makes the viewer ask himself where these can be. The clouds fill in the space at the sides nicely. This is altogether a very nice "pretty" composition which will appeal to aircraft enthusiasts and others too. One to hang on the living room wall.